When Oliver Greschke's alter ego Magnum38 growls from within it means, “Put your legs up! How else am I supposed to wipe the blood from the dance floor?” His 2001debut EP, 'Revolver Tracks', was a one-of-a-kind drum n’ bass detective rock opera, without the vocals. Only on this label. He also had a couple of tracks on the Cozmic Suckerz series and was a regular DJ at the Lounge in Mannheim. But it's time to begin 2004 with some retribution. 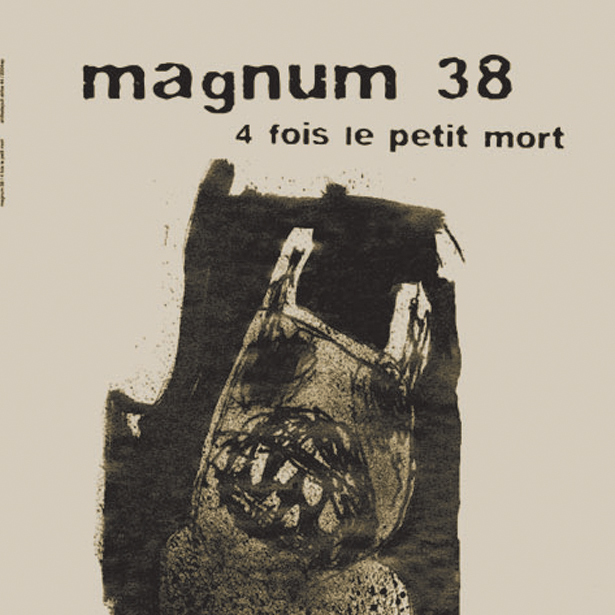 '4 fois le petit mort' brings together four tracks onto one piece of wax we would die for; cross-cutting work on Shitkatapult's sound without any residual handicap. Whoever had hoped for an extension of the drum n’ bass crimes should now look to call the serious fraud claims office. '4 fois le petit mort' is the right ammo for any DJ weaponry when blow up dolls and cardboard cut-out dancers clog the dance floor. The 'Sägemann' dresses up as a dentist pressing down his nervous foot onto the bass pedal of the patient's chair, thus giving the gnarz-sound some root treatment. Is someone trying to up the ante here for Raumschmiere's throne? 'Klink Jive' shuffles through minimal techno vibes and runs in every rubber clinic among patients with open legs. The concept of 'Klick Klick' could easily be heavyweight rawkus garage at marching tempo. It's a track for the trucker disco with free parking for a 40-ton truck. Last but not least, the 'Zerstäuber' dies a small death in the final groove. This doesn't happen without sending a beginner’s guide to broken rhythm schemes through the PA for IDM-SAT test-takers. An essential piece of wax between Shitkatapult CD’s.